My human has a poorly paw. My human has a poorly paw… She whacked her baby toe whilst she was prancing around the boat and it’s gone an impressive shade of purple. I sent her off to the hospital and luckily it’s not broken, it’s just a bad trauma. She’s been told to rest and keep her paw elevated for three days so it’s not too bad. I’d share a photo of the purple paw, but it’s really quite disgusting… Human’s paws are ugly! « My lobsters have names! you always know exactly what 2 say or which photo 2 post 2 either give me something 2 think about or a laugh 2 get through my day!!! Ouchie! My Motor Mommy is ALL the time banging her paws on something…. you’d think she’d learn to wear shoes! Hope your mommy’s toe is all better soon! That means you have a built-in lap for three days! And everyone knows the power of the purr. She should be healed in no time. Ouch! That does sound painful. I hope your human’s toe heals quickly. Ouch, that is not good. Hope your human heals quickly. You have an excellent looking paw! “Here’s mine instead”…………..luv it ! I think there will be a bunch of naps ahead, so enjoy. By the way, your paw is beautiful. Humans are so silly and unsteady on their feet. They only have two! You must give her lots of cuddles. There is nothing cuter then a paw. Especially YOURS! We hope your human’s paw heals quickly, Bailey. Purrs for your Mom’s hurty toe. Your toes , however, are very cute! We love your pawsome paw!! Ouch! Hope your mom’s paw is better soon. You should lie down on top of it, B. That will make it feel better. 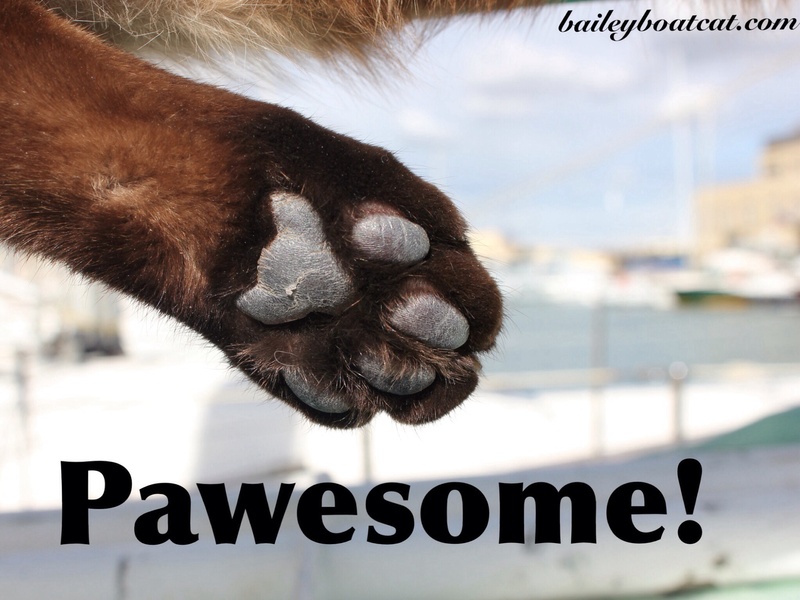 Awwww…human paws aren’t all ugly…but your paws are soooo pretty! You take care of momma while her paw heals, Sweetie! Oh that’s too bad about your Mum’s toe……these things happen as humans aren’t as “graceful” as we cats are! Hope it gets better real soon……..
Sending purr-ayers that your mom’s toe heals up quickly! Pleeze give Lady Loiuse mee reegardss an LadyMum’ss also. Wee hope her toe healss soon an shee iss back up an runnin inn purrfect condition!